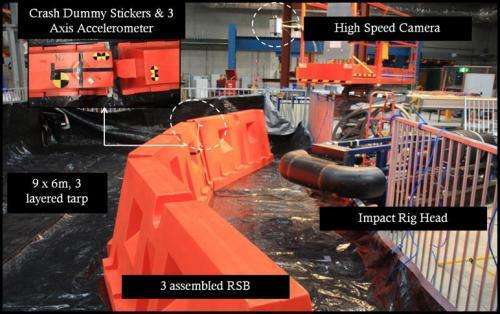 New portable, composite, steel and plastic water filled road safety crash barriers developed by a QUT research team to withstand high speed impact will be manufactured by a Brisbane company and sold worldwide, reducing the severity of accidents and helping to maintain traffic flow. Under an exclusive worldwide licensing agreement brokered by qutbluebox, QUT's innovation and knowledge transfer company, Queensland based Centurion Barrier Systems Pty Ltd will begin manufacturing and marketing the barriers internationally. Professor David Thambiratnam from QUT's School of Civil Engineering & Built Environment said the barriers could be adapted to suit a range of vehicular speeds. Their commercialisation is the culmination of a five year research project supported by an Australian Research Council Linkage Grant with Centurion Barriers as its industry partner. "The new barriers have the ability to re-direct errant vehicles with limited lateral movement which maximises the usage of limited 'buffer' space between roadside construction and passing traffic, which is a common failing of some existing solutions," Professor Thambiratnam said. "The associated simplified barrier installation mechanism also assures easy access for paramedics to the buffer zone in case of emergency." Bluebox CEO, Dr Peter Isdale said the patent pending QUT road safety crash barrier had a unique joint mechanism coupled with impact resistance characteristics. "The QUT road safety crash barriers are unique because they could be one of the only deformable, portable barriers on the market capable of enduring high impact collisions," Dr Isdale said. "Most importantly they have the potential to decrease the severity of high-speed crashes into barriers, leading to fewer fatalities, injuries and damage in work zones." Centurion Barrier Systems CEO, Peter Stewart said the company would begin selling the QUT road safety crash barriers in Australia and New Zealand, with the United States to follow. "Our aim is for the barriers to be certified in 2015 to meet the new MASH standards. We believe the new barrier is actually going to be one of the few systems to comply with changes in the MASH regulatory requirement for road crash barriers and are expected to meet TL1 and TL2 levels," Mr Stewart said. "They could even be the first barriers of their kind in the world that satisfy the TL3 (100km/h) requirements."